While it is important to know that there is no way to prevent aging, there are ways to slow it down. It is easy to spot signs of aging in African-American women starting from our early 20's. In today's society, people take plastic surgery into consideration and expensive black women's skin care products to improve the look and feel of our skin. While these are always an option, it's never too late to prevent further damage to your skin by simply making some lifestyle changes. You don't have to take the drastic measures of plastic surgery or spend tons of money on skin care later in life. Smoking causes wrinkles! If you do smoke, quit. We all know that smoking is bad for us and affects our body negatively. Smoking contributes to premature aging and many other health problems. The many chemicals in cigarettes influence the skin's structure and dehydrate the cells, resulting in increased aging. Catch up on your sleep: People who sleep at least seven to eight hours a night are healthier than those who lack sleep. Sleeping allows your body to repair cellular damage and recuperate. To help prevent signs of aging for your face, try sleeping on your back. It may sound odd, but sleeping on your stomach or your side can actually damage your skin by slowing down the circulation (your face is squished into the pillow). This can result in the appearance of unwanted and unattractive wrinkles. Sunscreen, Sunscreen, Sunscreen! Lather it on and learn to love it! It is very crucial to wear sunscreen everyday, even on cloudy or rainy days. Hopefully we all know that the sun has harmful affects to our skin. Sun exposure over the years leads to wrinkles and hideous pigmentation spots. There is No excuse to not wear sunscreen! Many African-American women have a common misconception that there is no need for them to wear sunscreen when it reality it's the exact opposite. Sunscreen comes in all types and is formulated to be lightweight and beneficial to your skin as well as providing sun protection. Moisturize & Hydrate= Younger Looking ... skin from the inside and outside! Hydrated African American skin is healthy and looks almost moist while helping show fewer wrinkles and lines. As we age, our skin loses elasticity. Using moisturizers with ingredients such as vitamins, jojoba, aloe vera, and Shea can help repair your skin. Consistent moisturizing is one of the best ways to restore elasticity and prevent the breakdown of African American skin. It is important to drink TONS of water to hydrate your skin internally and to use a good moisturizer. Healthy Living, Healthy Skin Keeping a balanced diet can dramatically strengthen your skin and prevent premature aging. Fruits and antioxidant-rich produce give your body strength to fight and repair damage. Keeping your insides healthy means you will have less external maintenance. So, whether you're in your 20's, 30's, 40's 50's or 60's, your skin is maturing. What better way to fight the signs of aging than to take the suggestions to heart and take care of your skin from within as well as use a proper skin care regimen to take care of it externally. African American Skin-A Guide To Great Ingredients! Changing The Color of African American Hair - Naturally! What's The Best Advice Your Black Skin Care Specialist Can Give You? - Moisturize! Black Hair Care -Relaxed or Natural? That is the Question. Black Skin Care - Nature In Toxins Out! What Are Essential Oils and How Can They Help My Beautiful Black Skin? Natural Black Hair Goes Corporate! Are There Simple Steps To Ridding African American Skin of Acne? Hyperpigmentation-What Is It And How Does It Fit Into Your African American Skin Care regimen? 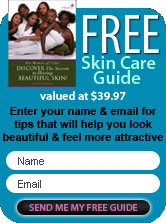 Black Skin Care -Wedding Day Preliminaries -What About Your Beautiful Black Skin and Hair? Black Skin Care - Does Your Face Talk? Black Hair Care: What Makes Your Hair Healthy? Black Hair Care - What can I use to make my hair grow? Eye Lash Extensions? Oh My! African American Skin Care: Is It time For A Makeover For You Ageless Beauties? Is Your Beautiful Black Skin Appearing Older Than Your Age? Happy New Year To You and Your Beautiful Black Skin! Have You Fed Your Beautiful Black Hair Lately? Is Your Lifestyle Affecting the Beauty of Your Black Skin? What's the Most Important Part of Black Skin Care? African American Skin Care: What Are Your Challenges and How Can You Treat Them Naturally. Black Skin Care and Salads, What Do They Have In Common? The Black Hair Care Industry Is Changing, How Does It Affect You? Are Facials The Secret To Flawless Black Skin? Hyperpigmentation! Is There A Secret To Eliminating It? Should African American Skin Get Microdermabrasion? Acne and African American Skin - How Have You Approached Your Treatments? Why Should You Use a Face Serum When Caring For Your Beautiful Black Skin? Will Natural Hair Care Ever Die? Thinking About Essential Oils for Your Natural Hair? 4 Reasons to STOP Thinking and START Using! Moisturizers and African American Skin, Are They Necessary? What Causes Dark Circles Under Eyes for African American Women and How Can They Be Treated? Dark-skinned Beauties: Do You Really Need a Sunscreen? Exfoliation and Your Beautiful Black Skin: Does It Really Do a Body Good? Is the Beauty of Your Skin and The Health of Your Hair Tied Into the Foods You Eat? What's your greatest skin care challenge? As women and a growing number of men of color, what's your greatest skin care challenge? Whether it's dark spots, uneven skin tone, dark circles,puffiness under your eyes or hair that won't grow, you'll find a product that can possibly become the solution to your challenge. Moisturizers and ingredients that hydrate your skin will always be your best friend, for your face, body and hair. So look for products with nourishing and nurturing ingredients. Shea butter, cocoa butter, mango butter and jojoba oils are a few of the ingredients to keep on your list. We've got new additions to our store for you. Essential oils have been known to help calm and soothe skin and scalp irritations. Although you'll find a sample kit on the hair category page, you can use them for any of your skin and hair care needs. The hair care sample kit has been given an upgrade. We've increased the size of the container on the shampoo and conditioners and added a hair butter sample to the mix. Although there's beauty in your blackness, your skin is sensitive and needs protection from the sun just like everyone else. So if you know you're challenged by sunburn, add a few drops of Lavender essential oil to Jojoba and Grapeseed Oil and create a nice body oil for yourself. It will bring comfort and beauty back to your skin. We're listening to you and your suggestions, so keep an eye on the category pages and your emails for updates.